Subject: Where Are Silver Prices Headed? Investors keeping up with today's silver prices had a rare down week last week, as the price of the iShares Silver Trust (NYSE Arca: SLV), a proxy for the price of silver, slid from $16.41 on May 17 to close at $15.69 on May 20. So where are silver prices headed next in 2016? The slide marks a rare set of consecutive down days this year, as the white metal has enjoyed a major bull market in 2016. The price of silver rose 27% from January to April, beating gold's climb by 7%. Money Morning Resource Specialist Peter Krauth believes that silver prices are headed to $22 by year's end, a climb of more than 40% from Friday's close. He believes many factors support the continuing advance of today's silver prices. The first number to look at for a silver price prediction is the gold/silver ratio. The gold/silver ratio is the number of ounces of silver that it would take to buy one ounce of gold. It's an important metric because silver prices are influenced by the price of gold, whether gold advances ahead of silver, along with it, or behind it. At a current gold price of $1,252.90 and a silver price of $15.69, the current number of ounces of silver it would take to buy one ounce of gold is 79.8. That's very near the last peak of the gold/silver ratio – when, during the 2008 financial crisis, the ratio hit 80. Post the peak, the price of silver went all the way up to $49, and the ratio fell. The historical average for the gold/silver ratio is a range between 47 and 50. For the past several months, the range has swung between 72 and 83. If it returns to its historical range, silver would rise to over $22 per ounce. That's Krauth's forecast for 2016. Krauth also forecasts that the gold/silver ratio will drop to a 15 to 16 range over the next four to five years. That would result in silver prices of roughly $250 per ounce – a skyrocket from today's prices. But the gold/silver ratio is not the only bullish case for silver. The other is extremely strong demand, from businesses and consumers alike. Silver has very high conductivity. As such, it is widely used in photovoltaic (PV) solar panels. In fact, 15 to 20 grams are used in each solar panel and account for 10% of all silver produced from mines every year. Solar energy is growing rapidly, driven both by concerns about climate change (solar energy is an alternative to gas and oil, which foster the greenhouse gases that result in climate change) and by generous government tax subsidies for solar energy. Renewable energy is set to rise to a $158 billion market by 2023; solar panels, as part of this, will see strong demand. Silver will be part of that increase as well. Silver is also used in iPads, computers, plumbing, mirrors, dishwashers, watches, and perhaps your alarm clock because of its conductivity and durability. It is also used in ball bearings, batteries, and switches. These consumer and industrial uses will keep silver demand strong – and the price up. Finally, investors themselves have been demanding silver at a smoking-hot pace this year. Demand for the American Silver Eagles, according to the U.S. Mint, has been 25% above the demand registered at the same time in 2015. The U.S. Mint had sold nearly 17 million American Silver Eagles by mid-April. If the current demand pace at the U.S. Mint continues, this year may set a record for sales of the silver coins. And supply? It doesn't begin to keep up with demand. In fact, the world's available silver supplies have been declining steadily for the past 15 years. A 4,040-tonne shortage of silver was recorded in 2015, considerably over 2014's shortfall of 2,445 tonnes. In total, according to the Silver Institute, the use of silver rose 3.4% last year, to 36,407 tonnes. That was nearly a record for silver demand. We are looking at an excellent fundamental picture for the price of silver: strong demand and dwindling supply. Given the excellent picture for silver prices, how can you make money? As with any precious metal, investors can buy the physical bullion, bars, or coins. However, that can present problems in storage. 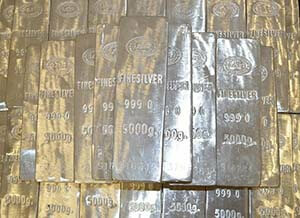 There are also funds that trade in physical silver, silver miners, and silver spot prices. The funds can be bought on the major exchanges, so they are convenient to purchase as a way to play today's silver prices. Due to the silver bull market, the funds have become extremely popular. March 2016 posted the fastest pace of silver fund buying in more than two years. Holdings rose by 903 metric tons in the month, according to Bloomberg's tracked exchange-traded fund (ETF), the highest level in more than a year. Money Morning has two picks for silver funds. The first is backed by physical silver held in Canada. It's the Sprott Physical Silver Trust (NYSE Arca: PSLV). The physical silver backing the fund is periodically inspected and audited. Nicely enough, investors who hold PSLV for a one-year minimum period benefit from a 15% capital gains tax, below the tax rates of most precious metal ETFs. The other is the ProShares Ultra Silver ETF (NYSE Arca: AGQ). This ETF has risen more than 45% in 2016. AGQ holds futures contracts on silver rather than the physical metal. Its objective is to trade on the spot price. Investors should remember that precious metals are volatile. Money Morning Chief Investment Strategist Keith Fitz-Gerald recommends dollar-cost averaging as a safeguard against volatility. Buying set amounts of precious metals at designated intervals throughout the year decreases the risk of buying at the highs and increases an investor's potential to buy on dips. Want to know more about precious metals? Download our report: The Essential Guide to Buying Gold & Silver.